There are two main kinds of harmonics: pinched and natural. Pinched harmonics produce a high squealing sound and are quite tricky to play since you pinch the string between your thumb and the pick. Natural harmonics are what we’ll be looking at here, though. They are played by touching the strings lightly at certain ‘node’ points. These produce a clear, bell-like tone that are higher in pitch than the regular fretted notes in the same position. You can hear the ringing sound of natural harmonics on Steve Vai’s Sisters and they are used to create a riff in Puddle Of Mudd’s Blurry. When played using distortion their high pitches can contrast low, heavy riff s, just listen to Machine Head’s metal classic Davidian. Natural harmonics are played by lightly touching the strings directly over certain frets. The best place to start is the 12th fret. Place your first finger across the first three strings (the thinnest ones) so it hides the fret. Make contact with the string, but don’t push too hard. 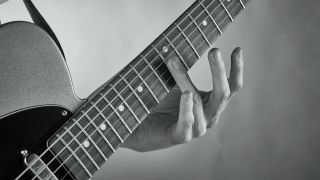 Your finger shouldn’t be anywhere near the fret. Strum firmly through the strings then release your fretting hand from the strings. Notice how the notes continue to ring. As a matter of fact you can. There are loads of places, but some are easier to play than others. The next locations you should try are the 5th and 7th frets. Stick to the first three strings, but be careful with your finger placement. There is less margin for error at these frets, so if you aren’t directly over the fret you might find the notes don’t ring out correctly. Once you can play each location cleanly, try moving between them. Well, you don’t always have to strum harmonics. You can play them individually to create beautiful melodies. You’ll be changing notes quite quickly, so make sure you place your fingers accurately. Remember, if you want the notes to ring into each other you have to make sure you don’t accidentally mute the other strings as you fret a new note. Natural harmonics can be found all over the fretboard. This diagram provides a quick look at where you can find them. Aside from the 5th, 7th and 12th frets, there are a number of other frets you can play natural harmonics at but these are more tricky to sound and, in the case of the 2nd and 3rd frets they are located slightly to one side of the fret rather than directly on top of them. Release pressure on the strings as soon as you have strummed and remember to concentrate on accurate finger placement. The main challenge with this simple melody is placing your fingers accurately while playing the correct rhythm.